The following function is used when someone, who does not have access to a particular Online Pictorial Directory, wants to have access to a directory other than a Guest Login. Guest logins can be used by anyone, but this function is a request for a member login to a specific online directory. The following is a sample of the data you need for a request to get a login ID and access to the St. Matthew's Christian Church hosted with Picture-Directory.com. You will notice that all fields are required fields. The "Requested Organization Name" is pre-filled, by the system, when you click on the Request Login button on the main menu. When this is submitted, via the Request Login" button, a message is sent to the administrator of this online directory. 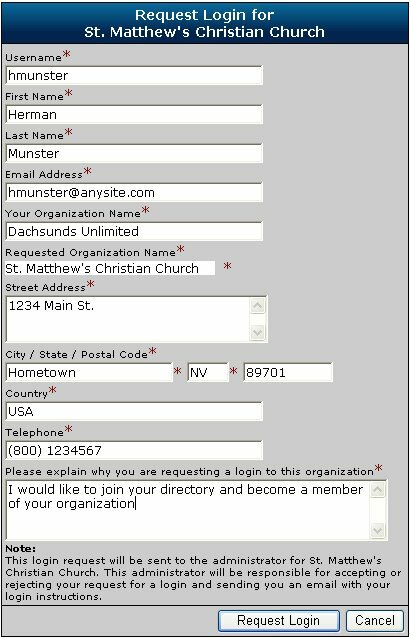 In this example, a request for an ID/username of "hmunster" is requested for this and only this online directory. If the user wants to access multiple directories, he/she must have a unique ID/username for each directory. Please review the help text in the SETUP function when adding a user. The "Please explain why you are requesting a login to this organization" field is a justification of why you would like to have full member access to this directory. The administrator will make a determination, based upon this field, whether to grant or deny your request. If the request is denied, the administrator should send an Email back to the requester telling of the denial. If the request is approved, the administrator should create a new ID/username for the directory and send a confirmation Email, with password, back to the requester.